This gown dates to the Victorian 19th C and is fashioned fully of off white bridal net. 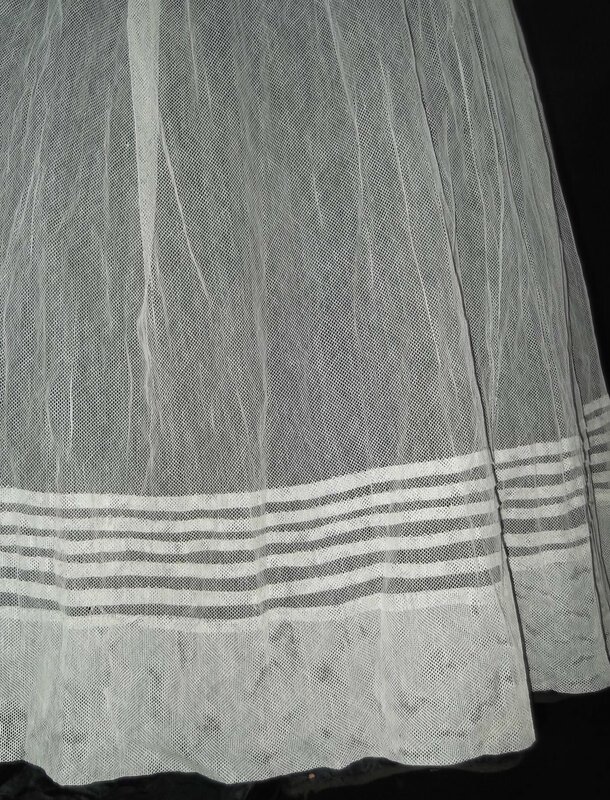 The skirt has narrow pleats along the hem, cut full in the rear to go over a bustle. The bodice has center pleats, chemical lace in florals travels along the collar, and on the cuffs. The gown was taken over darker petticoat and top, not included in the sale, nor is the bustle. 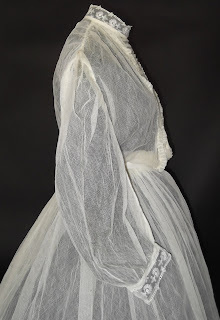 There is a faint even age color, several unseen bride breaks with two small eraser sized holes. Excellent condition, fully wearable. 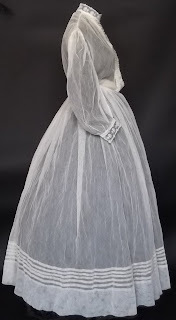 Measures 36 inches around the bust, 23 inches around the waist, 17 inches in its length, the skirt measures 22 inches around the waist and 40 inches in its length. That being said, the front to this one threw me for a loop. From the back and side, it looks like a normal mid 1860's dress...and then there is that....stuff. 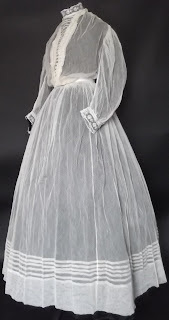 I'll look up some fashion plates later but it looks like it's about 1865ish. 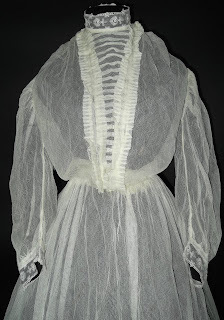 Carolann Schmitt just said on the Sewing Academy this week that sometimes mid-century whites were re-fashioned for the turn of the century lingerie dress look. I wonder if that happened to this one, or maybe it was just started to be remodeled. Or worn under another garment. 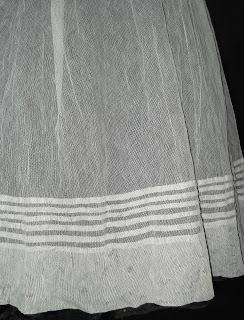 The armholes are something that was usually updated. Either way, aside from that, I agree it's mid-1860s. The skirt isn't a full as I'd otherwise expect for a sheer dress, and those sleeves seem later to me as well. 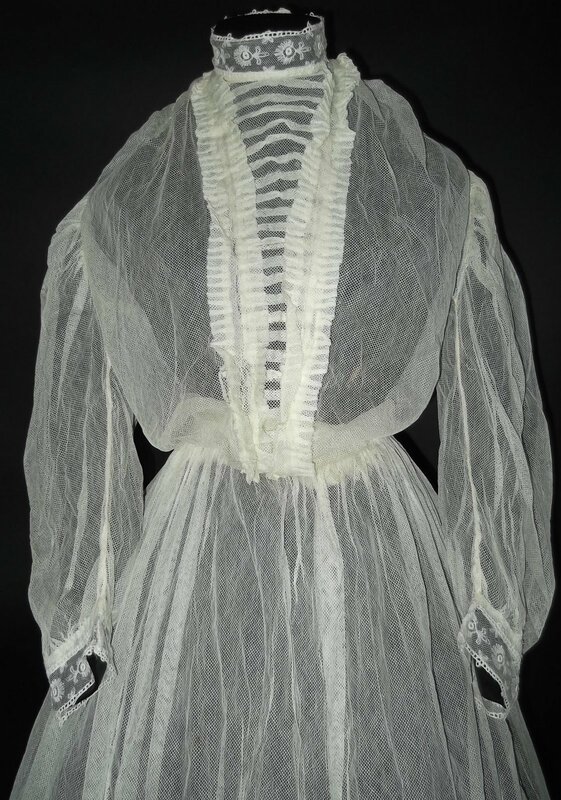 The net is unusual, at least in my experience; I've seen lots of white sheers, including nearly-transparent stuff, but never one that was actually net. I wonder if the back fastening was a remodel.